Doughnuts | Dessert Darling once declared the buttermilk donut from Tasty Donuts to be, quite possibly, the “best donut in Los Angeles.” Wow, that was a bold statement and required a joint venture follow-up. 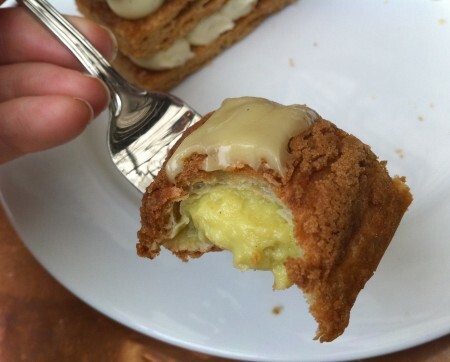 For years I have lived down the street from a darling French bistro that had the most lamentable French pastries. 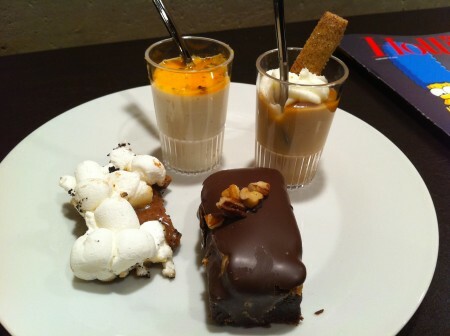 I mean, really- how can a Parisan cafe go wrong with the desserts?! Thankfully, The Little Next Door has hired a new pastry chef and wow, what a difference! 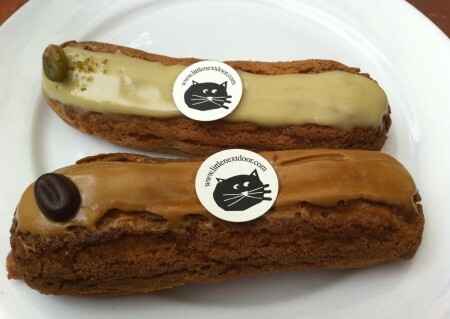 These sweet coffee and pistachio eclairs literally had my eyes rolling back into my head. Just look at that creamy, pistachio filling! 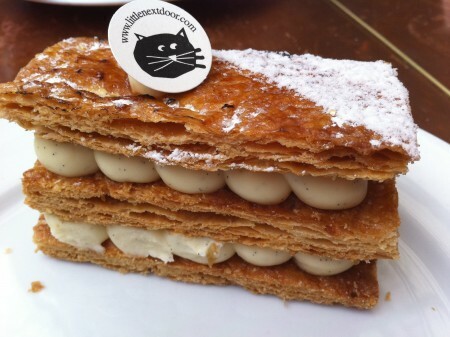 And while this flaky Napoleon was a little hard to eat, it’s gentle hand on the sugar made for a lovely and mild alternative to the eclairs. 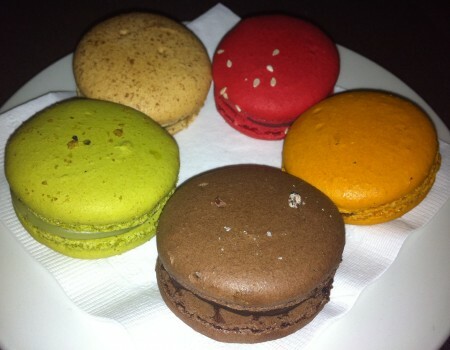 Even the macarons, for which I wrote this unfavorable review in 2010, are significantly better. I’m so delighted that The Little Next Door has stepped it up with their desserts! Now I can officialy call it one of my favorite neighborhood joints. Woohoo! I was so thrilled and honored to have an invite to the party for the 500th episode of The Simpsons at the Roosevelt Hotel in Hollywood. Naturally, there were a ton of desserts, including… Dooonuts. The cake donuts were ok, but what tickled me more was this tray of lovely options. 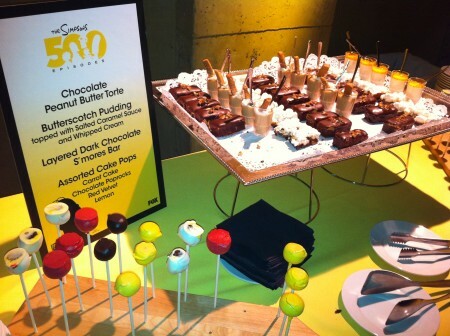 The S’mores Bar was insanely delicious, sweet, and buttery. Hands down, it was the winner. 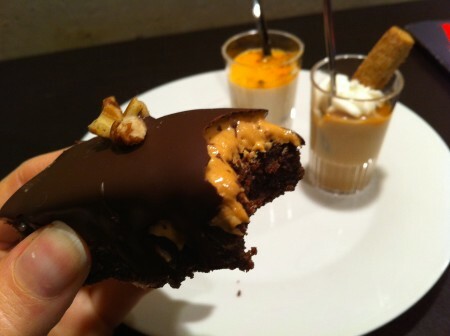 That said, the unassuming Chocolate Torte bar there had a surprising layer of peanut butter inside that made me giddy. And see that head honcho in the tall director’s chair? 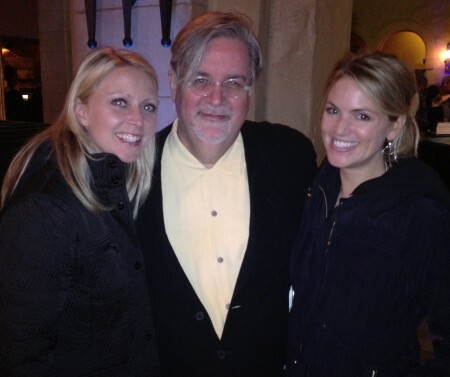 Yep- that’s just my buddy Matt Groening hanging with my friend and me. We go waaaaaay back (to 40 secs before this photo was taken). 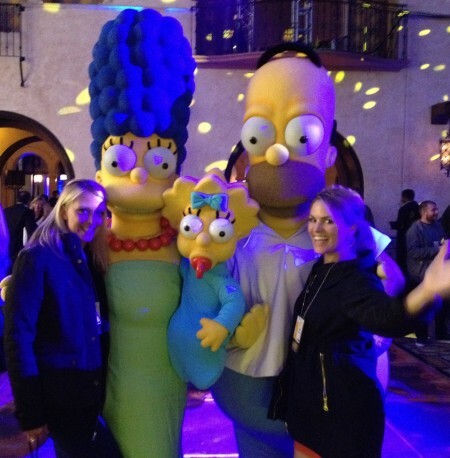 Of course, my night wouldn’t be complete without dancing with the Simpsons themselves! DOH! I ate too many desserts that night. Like, at least two of everything (mediocre donuts included). Awe well, it was an awesome night and well worth it. 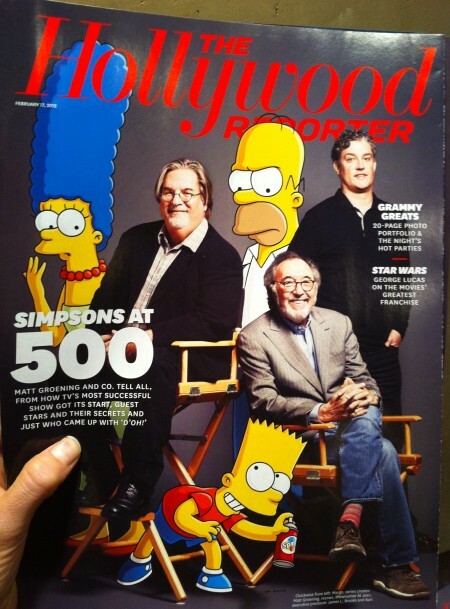 CONGRATS to everyone at FOX and The Simpsons for such tremendous success throughout the years! I remember when my family gathered around the TV for the very first episode together. It was an event for us that I’ll never forget! Fōnuts, So Good You Could Go Nuts? I was really excited to see a new little bakery open up on 3rd Street where “Kiss My Bundt” used to be. This wasn’t just any bakery, however, it was a Faux-Doughnut and coffee shop. Faux-Doughnuts, you wonder?! Yea, everyone else in line was scratching their head over that one too. 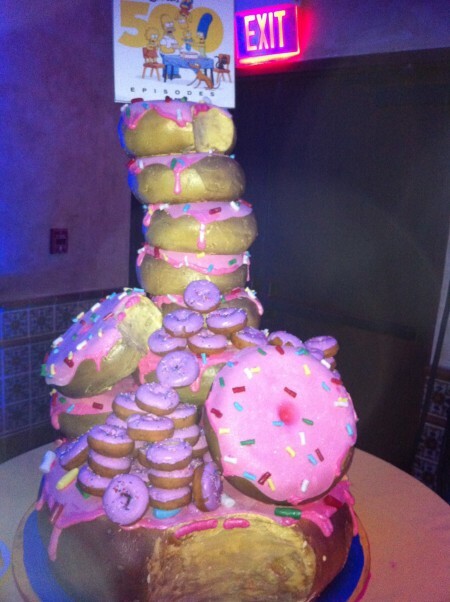 So these donuts are baked, not fried… doesn’t that just make them ring shaped cakes? Anything else “healthier” about them? Oh, ok, some are gluten-free (almond meal), some are vegan, and some don’t use white-sugar (errr, but they use brown sugar, which, pardonne-moi, is the same idea). Ok, so I tried a Gluten Free Chocolate Hazelnut and a Gluten Free, Vegan Lemon fōnut. The chocolate selection was a complete waste-of-space that reminded me of Snackwells Devil Food Cake cookies. Bummer. The Lemon fōnut though, was far tastier… and heavier. This super dense dessert surely had even more calories than a real donut! Hmm, sorry guys, I’m not sure I’m really on board here! 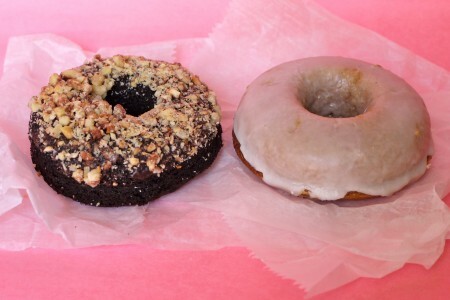 If you need Vegan or Gluten Free desserts, or a sense of adventure, then by all means, check out Fōnuts. The two fōnuts that I had were so wildly different in desirability, that who knows, maybe there’s an amazing option there that I never even tried. At the end of the day though, if you really want a donut? Why go faux? For more info on Fōnuts, click here. Wow, the Spanish donuts at Cobras and Matadors were pretty excellent poofs of fried dough with soft warm centers and a slight dusting of cinnamon-sugar. The “churros” were not your traditional Mexican donut sticks that you’d find at a fair, all firm and crispy and sometimes cold and stale. While this difference let down one of my girlfriends, I found the fresh warmth and bubbling softness of dough inside to be a total delight. What befuddled me was the dark chocolate pairing. While the chocolate itself was delicious, it’s strength completely drowned out the cinnamon-sugared flavor of the donut (which the churro could have used more of to begin with). A much better dipping sauce would have been caramel, butterscotch or even an icing-glaze to harmonize with the subtle flavors of the fried deliciousness before us. Oh wow- Wow wow wow wow wow. Ok, first off: I do not like Fried Food. Also, I do not like Oreos. Normally Oreos are too crispy, bland, and lardy for my liking (yes, I’ve made up the word Lardy and I think it’s brilliant). 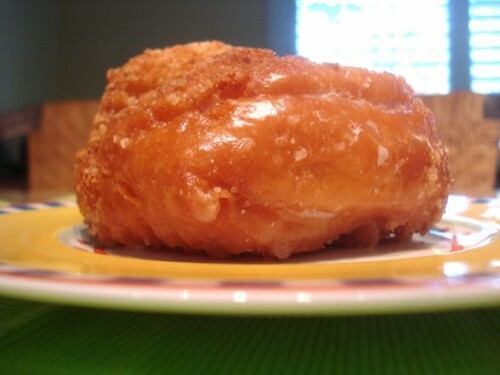 However, when deep fried inside a doughnut bubble, Oreos soften into a warm, magical filling with their soothing double cream stuffing and mild cocoa flavoring. 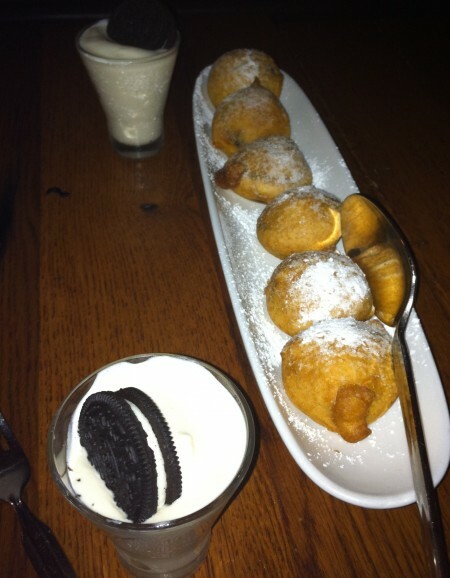 As if fried Oreos weren’t enough, Lavo Restaurant in New York serves their Oreo Zeppole with two sides of Malted Vanilla milkshake for dipping purposes. I might have put on 5 lbs in NY. Worth it? I think so- indeed, I do. If you live in Los Angeles, you've probably driven by Yum Yum Donuts about a thousand times heading up Highland or La Cienega by the 10. You see a happy face licking his lips and wonder…just how Yum Yum are Yum Yum Donuts really? Probably pretty gross..
Ben from B-side Blog is hilarious. I normally drop in on his site to check out his laugh-out-loud reviews on intellectually stimulating shows like, you know, The Real Housewives series on BRAVO (Ha). Today though, I was pleasantly surprised to find a dessert review!